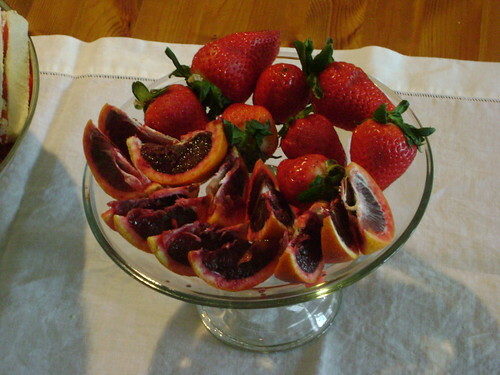 Mimosa, originally uploaded by Ayala Moriel. While Vancouver is freezing over, spring is here in other parts of the world (although it may seem like a very wintery weekend to those who actually live here...). 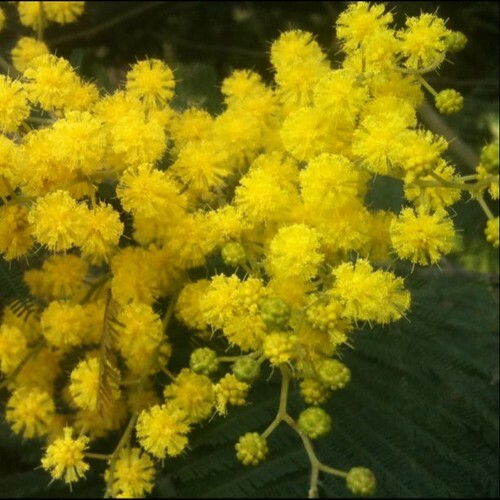 Splashes of yellow bring cheerful smile to my face, and especially when sniffing these particularly tiny mimosas, or acacias, be what they may, growing on the sides of the roads of beautiful Sonoma Valley, California. My, is this place beautiful! These tiny mimosas are only lightly fragrant (most mimosas are, actually). And they smell of spring: delicate sweetpea at first, with some underlining green notes of fresh cut grass and even carob blossoms. 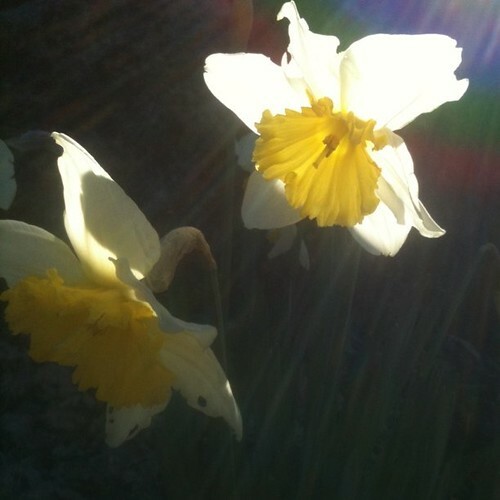 Daffodils, originally uploaded by Ayala Moriel. I'm stranded in Sonoma for another day (flying standby - there was no room on any of the flights out of Santa Rosa this morning) but I can't really complain, can I? This place is so cheerful, peaceful, beautiful and welcoming. 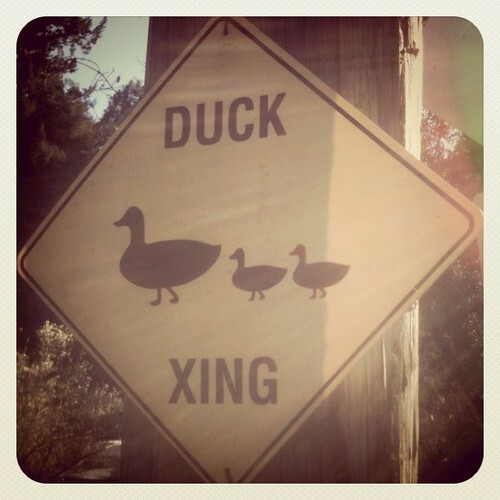 Ducks crossing, originally uploaded by Ayala Moriel. 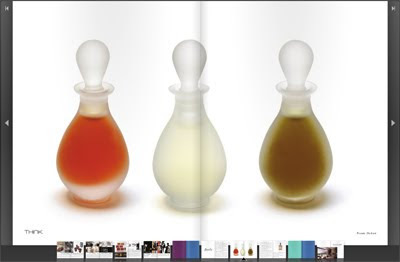 Think Magazine has a 3 double page spread about Ayala Moriel Parfums! Check out p. 31 and on in this online eco-friendly magazine (no print edition, only online). And thanks to my publicist Nicole Stewart for a job well done promoting my work, and to Noam Dehan for the photography! 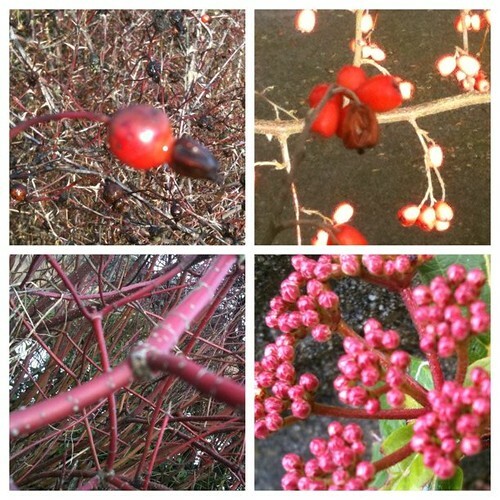 Winter Reds, originally uploaded by Ayala Moriel. In my previous article about structure and philosophy, I discussed a few of the most known perfume structures, namely the pyramid, and the more recent linear structures used in most of the mass marketed and largely synthetic perfumes today. I'm stuck in SATC (Seattle airport) waiting for my connection to Sonoma Valley (my first time visit there, just for the weekend, and I'm super excited about this trip!). So I have not only time to kill, but also time to contemplate some themes that have been of interest for me in the past few months, yet I was unable to fully contemplate, articulate or share with you, my dear SmellyBlog readers. Before sunrise, the plane took off from Vancouver, and descending above the city it was fascinating to watch grids of lights, veins of highways pulsing with early incoming traffic. I was amazed at the laborious nature of mankind, much like a giant ant nest, the city even at such early hours was everything but dormant. And the patterns of movement, light and technology seemed strangely organic in this context. The Gulf Islands, originally uploaded by Ayala Moriel. 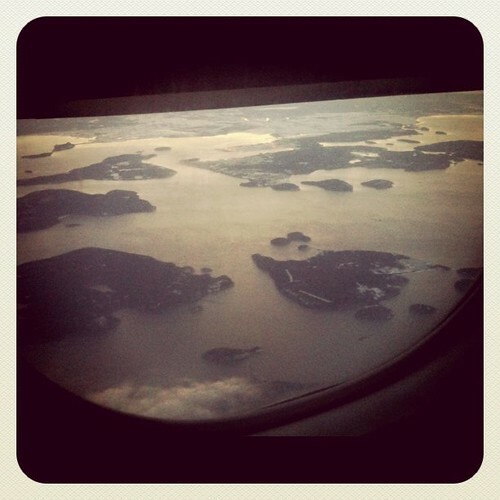 The plane continued to fly over the Gulf Islands (these are the islands that populate the Georgia Strait). The flight itself is a mere 30 minutes if not less; and there is no time to get tired of it and resort to entertainment or any other distraction. Ahh, I can only wish all my flights were that sweet and short! But back to the beautiful Gulf Island, slightly dusted with a thin layer of white snow, I could not help but return to the theme that have been buzzing in my head for quite some time: the subtle structures of nature, which are seemingly random, chaotic or make little sense when observed from too close. The aerial view reveals more than meets the eye at sea level. And these scattered islands seem to form some kind of a rhythmic pattern. Fractals are structures that are found in nature, and have what we perceive as fascinating visual patterns that seem random, but in fact follow “inherently unpredictable yet generally deterministic rules based on nonlinear iterative equations”. In the past few months I’ve been wondering about structure in perfumery: is all there is to it is pyramids and straight lines? Could there be a structure that is more organic, flowing and chaotically lively? Recently, the perfumes I’ve created have become less structured in the pyramid sense of things, but nevertheless have their own internal laws and patterns. After months of searching for these patterns in nature and snapping photos (interestingly, turning them from 3D to 2D actually helps understand the patterns as well), and a standby flight later, despite the months of relative silcence on my journal (aka SmellyBlog), I think I’m arriving at something here. My perfumes have become more and more like those fractals: they have their own internal laws that connect the different ingredients or materials together. Yet they spiral out rather than build up or drill down to the depth of lingering base notes. Much like the thorns and rosehips in the photo above, or the red branches right under it, there is a pattern of branching out, expanding, reaching out… I’m still in the process or wrapping my head around what is it that I’m doing, and very far from actually being able to explain how this structure works, or why I’m blending the way I am currently, but I think I’m getting somewhere with this and the fractal comparison really helps, because I think that in reality, perfumes are a fractal, and not a pyramid, even if you try really hard to stuff them into such structures. Rather, they are organic, free forms that echo each other and grow into and out of each other while constantly interacting, spiraling… This is definitely going to be continued. Ida Meister (aka Chaya Ruchama) has reviewed Jasmine Pho ltd. edition perfume on Cafleurbon. Leave a comment here or there to enter to win one of two samples of this perfume, as well as recipe for Ida's own Salsa Verde! Astroscentology in Fragrantica Dedicated to Ayala Moriel Parfums! Fragrantica's Hieronimuss has surprised me with an entire Astroscentology column dedicated to my perfumes. I'm wearing Fetish today, to match my zodiac sign. What are you wearing? Beautiful ladies engaged in the sensory world of perfumery. 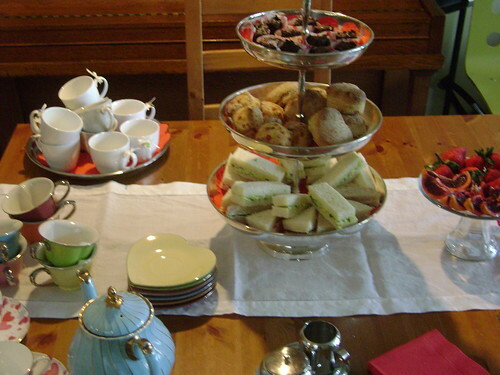 The infamous 5-tiered tea tray with all the goodies! Roses et Chocolat HOT chocolate, served with CocoaNymph's very own saffron marshmallows! Roses et Chocolat hot drinking chocolate, topped with saffron marshmallows! 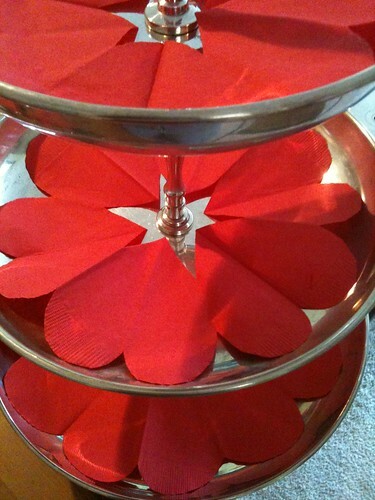 Rachel of CocoaNymph have created them especially for my tea party. I used her drinking chocolate (dark Belgian chocolate, melted into half-and-half...), and infused it with rosewater and a dash of hot chili pepper. The most seductive hot chocolate I've ever experienced...! 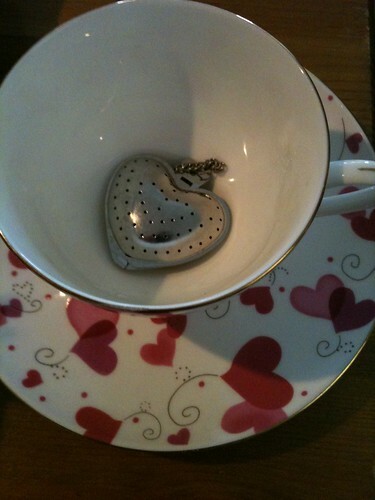 Hearty tea cup with a heart tea strainer. Layering the tea try with hand-cut heart doillies. Little door prizes, including raffle tickets, miniature Roses et Chocolat bars and a fragrant tea bag (Earl Gray Cream). Nao and Jessica reading the fanbooks and picking favourite scents. 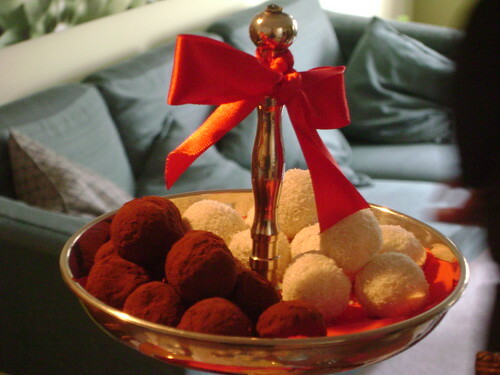 White Potion truffles (white chocolate + tuberose + coconut), and Guilt truffles (dark chocolate + orange flower + wild orange). 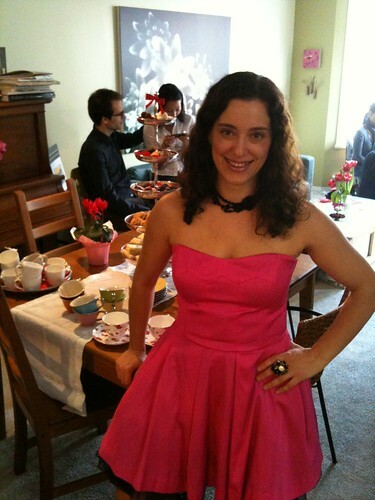 The tea party on Sunday, February 13th was a great success. And it was all thanks to my awesome friends - Jolanta Va (who took most of the pics for the party, and helped to host it), Monique Trottier (who helped me to make all the sandwiches, decorate, host the party and help the guests pick perfumes) and Rachel Sawatzky (with her amazing chocolates and marshmallows!) that I was able to pull it off, once again... These parties are a lot of fun to initiate, but a huge production that is quite devastating to undertake on my own. I'm so thrilled, thankful and happy to have such wonderful friends and wonderful customers who support me in Vancouver. I can certainly feel the love and hope you do too! Like our Facebook fanpage, or follow us on Twitter, and get entered to win one of 2 double-passes to the Valentine's Day "Spice It Up" Tea Party tomorrow (Sunday, February 13th, 1-3pm). For those of you from out of town, the benefits of being part of this is that we will being weekly specials for these social netoworks only. 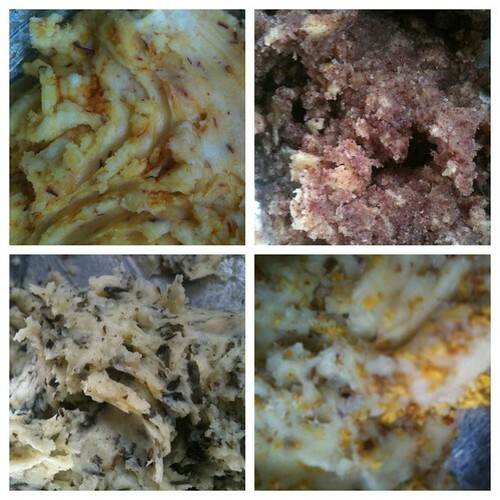 Infusing butters, originally uploaded by Ayala Moriel. I'm infusing butters for shortbread cookies - four flavours. Can you guess what these are going to be? You have till 4pm to figure it out - and get a chance to win a Guilt scented chocolate bar (though I'd much rather to be able to ship you some cookies, it is nearly impossible to do so without breaking them en-route). We're in Toronto Life and Vitamin V! Vitamin V features Ayala Moriel Parfums in their Valentine's Day gift guide. Hot CocoaNymph, originally uploaded by Ayala Moriel. 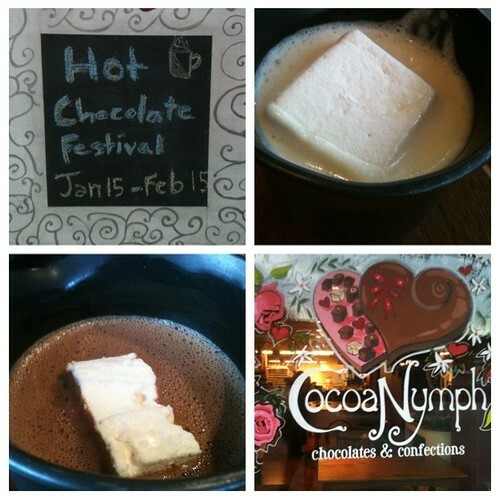 I heard about the hot chocolate festival pretty late - when it was already halfway through. And of course, I had to at least make a pilgrimage to Cocoa Nymph (3739 West 10th Ave. @ Alma) and try her legendary hot chocolate. All of my visits there were purely business so far, and very busy at that - so I never actually just sat down and enjoyed a cup of hot CocoNymph before! Fortunately for me, Rachel was taking a little break, and we were able to just hang out, relax, chat and enjoy her company as well as a few other regular customers and friends whose faces I already recognize (and sometime can even guess their name right...). CocoNymph should be a weekly pilgrimage to Kitsilano just for that atmosphere alone. And did I mention they do live music shows there - almost every weekend? Back to hot chocolate: You can find 4 flavours on a regular basis - white, milk, dark and dark spicy (inspired by the original Aztec power drink), made on site from real wholesome ingredients and topped with Rachel's marshmallows. During the hot chocolate festival there is a new limited edition flavour at CocoaNymph every week - for both the hot chocolate AND the marshmallows, which are made on site from scratch! The first week, it was the reverse switch - white hot chocoate topped with a milk chocolate marshamllow. Second week it was hazelnut hot chocolate topped with Crown Royal marshmallows. Last week - Earl Grey hot chocolate topped with Guilt inspired marshmallows (made with orange oil and juice!). The Earl Grey was sold out that weekend, but I have I tried the Guilt-y, orangey marshmallow, and am thrilled to report they are utter bliss and I just can't wait for the Earl Grey infused hot chocolate to return. This week, the special flavour is a black-pepper infused hot chocolate topped with salted caramel marshmallows! Salted caramel is CocoaNymph's signature flavour - the first bonbons Rachel made and got this business started were her salted caramel chocolates. Her most popular confections are the English Toffee (highly salted and crunchy) and the SeaNymph bar (with sea salt and crushed pieces of the above-mentioned English toffee). 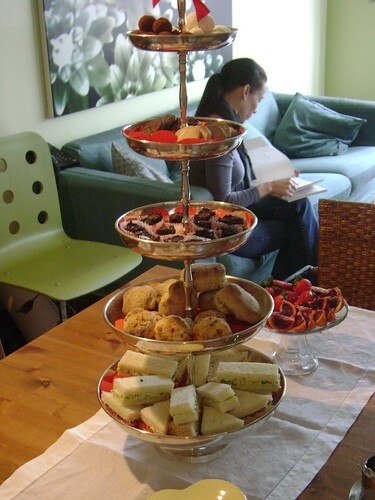 The experience was inspiring, and I'm really intrigued by the combination of tea and chocolate together... Or any infusions into liquid chocolate... Mmm... Maybe an idea for something to serve on my Valentine's Day "Spice It Up" Tea Party next Sunday? What do you think? P.s. 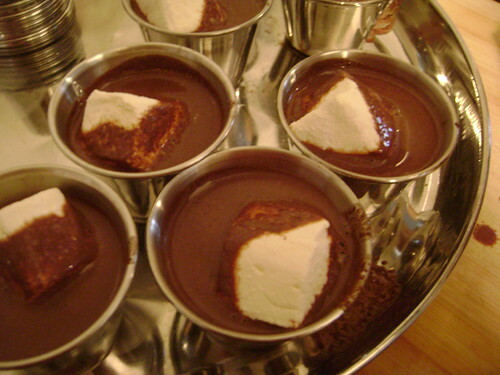 In the photograph: Top right is white hot chocolate topped with vanilla marshmallow. Bottom left - dark hot chocolate with salted caramel marshmallow. Chinese Herbs, originally uploaded by Ayala Moriel. Well well, I will spare you the details on why I ended up at my TCM clinic again today (nothing major, but necessary enough to submit my entire body to 12 needles for an hour without movement...while meditating about the strange connectedness of the body. It's not so philosophical - the moment you move as much as a millimeter of the right wrist, for instance, you feel an unbearable pinch in the left leg...). Anyway, while anticipating the spontaneous visit, I was reminiscing fondly over the scent of angelica that permeates the TCM's office upon entry. Bitter, pungent yet somehow comforting. 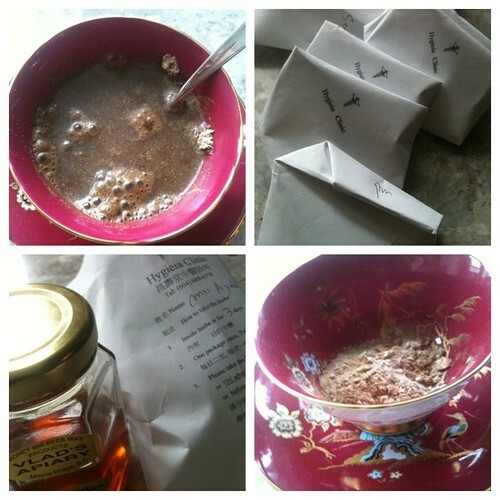 I'm typing this while still gagging on the potion you see in the photo (even though with the honey it's not nearly as bad as I had to take it - straight - back in 2009). But in my memory is still ingrained the odyssey and how it really saved my back (and my life) at the time. So, you probably want to hear no more about these herbs, and are slightly curious about the perfume I'm wearing today... It's not really a perfume, yet. It's an amber accord, which I created very much as a result of my exposure to these crazily effective, angelica-and-dust tasting bitter herbs. It has the smokiness of don quai (Angelica chinensis - aka Chinese angelica), with a bit of celery-like tones of lovage. Both very dark. And it's sweetly comforting like any amber should be - honeyed, soothing, soft and warming. I love wearing it on its own. But I've also treated it as an amber base in other perfumes I'm working on. And like so many of my perfumes, it takes years to really refine an idea or develop it. Not to mention that one could and should only release so many perfumes in one year... So it will take time before anyone will be allowed to smell it (unless you come visit me in the studio in person, that is!). I love working on projects like that at their own pace, and with their process unique to them. Unrushed, authentic, yet with some kind of perspective (being reviewed and reworked years after the moment of inspiration is sometimes an advantage!). It's just how it should be. 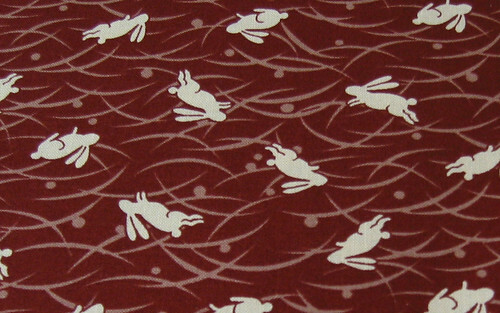 Japanese Jumping Rabbits WIne, originally uploaded by luckykaerufabric. Xīnnián kuàilè and Gung hay fat choy*! Wishing a happy lunar new year to all of you who are celebrating today. Subscribe to Eco Fashion World newsletter, and enter to win a Bois d'Hiver mini! 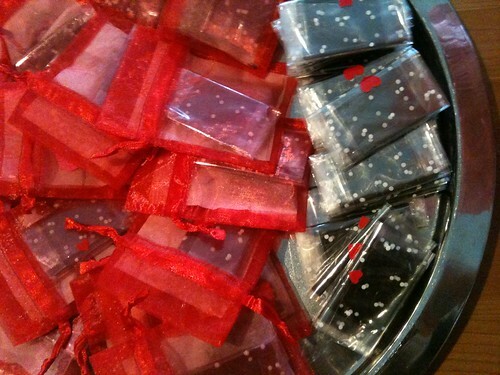 EauMG Valentine's Gift Guide features the scented chocolate bars I've created with CocoaNymph.